Draymond Green was amazing in Game 7 of the 2016 NBA Finals. It wasn't enough. Draymond Green of the Golden State Warriors speaks to members of the media after being defeated by the Cavaliers in Game 7 of the NBA Finals on Sunday in Oakland, California. The best player in one of the best games in NBA history suited up for the losing team. Draymond Green led all scorers with 32 points, pulled down 15 rebounds, and dished out 9 assists. He was the engine of the Warriors team on a night when the Splash Brothers stayed mostly dry (Steph Curry and Klay Thompson combined for just 31 points), Harrison Barnes stayed cold, and the Golden State bench scored 16 points collectively. Without Green, the best regular season team in history would’ve blown out on its home floor. He was on fire from the start, draining five 3’s in the first half to help his Warriors to a seven-point lead at the half. He ended the game 6 of 8 from behind the arc. With 5:37 to go in the fourth quarter, Green scored to put the Warriors up 87–83. A minute later, after six straight points by LeBron James, Green got the assist on a Klay Thompson bucket that tied the game for the final time. The Warriors, amazingly, didn’t score after that, with Green missing his only shot attempt, a long 3 with just more than two minutes to go. The Cleveland Cavaliers’ 93–89 win means Green’s Game 7 heroics will be largely forgotten. Instead, we’ll be talking about what might’ve been for the Warriors had he not been suspended for Game 5 after swatting LeBron James’ testicles in Game 4. Wow. Congrats CLEVELAND! Making history in dramatic fashion! 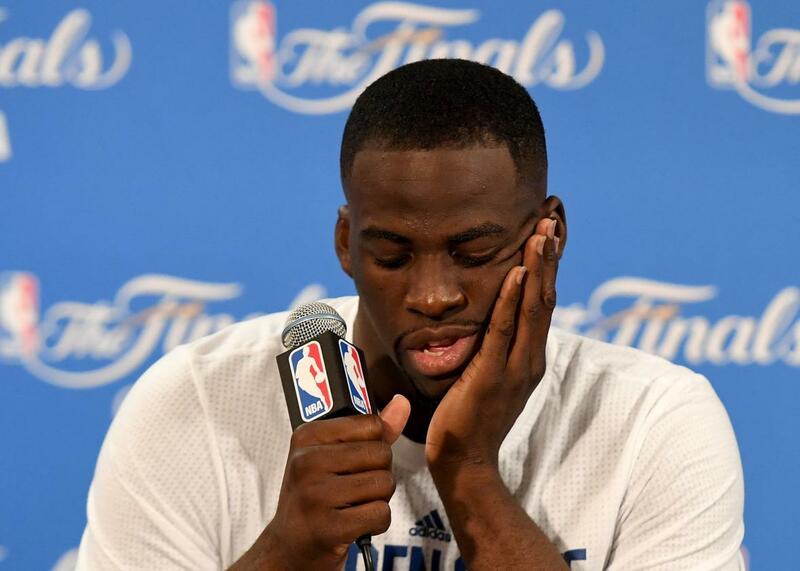 It'll be a long offseason for Draymond. Up 3-1..his suspension=turning point. Warrior fans blaming the league for Draymond Green's suspension, Steph Curry foul calls in Game 6, life in general. Stop, this was LeBron. Green did everything he could to drag his team to victory and absolve himself of blame for the Warriors’ collapse from up 3–1 in the NBA Finals. Unfortunately for him, his teammates couldn’t do quite enough to help him out.